"Together" is the unification of two gospel quartet heavyweights: The Gaither Vocal Band and Ernie Haase & Signature Sound. The DVD allows you to experience the stunning visuals of the concert, which are accompanied by impeccable sound quality. The quartets combine to sing worship songs that are best sung together, according to Bill Gaither, so that God can be celebrated in all of his glory. The result of this immense collaboration is one of harmony, celebration, and joyful worship. Experience the astounding evening of praise on this Gaither Gospel Series DVD - "Together." 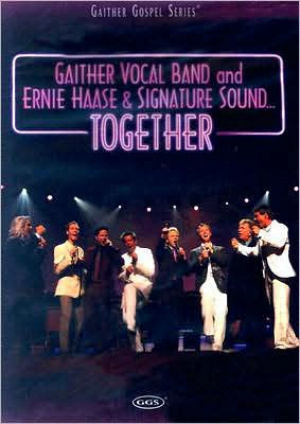 Together DVD by Gaither Vocal Band; Ernie Haase & Signature Sound was published by Capitol in October 2007 and is our 11147th best seller. The ISBN for Together DVD is 0617884478193. Got a question? No problem! Just click here to ask us about Together DVD. What region is the DVD please? A:This DVD (as with all the Gaither titles available at Eden) is produced in multi-region format and will play on all standard machines worldwide.